Time was when barley turned up only in Scotch broth. Now it has become chic, and there are endless ways in which to dress it. Soaked dried sour cherries or cranberries would be good here instead of pomegranates. Put the barley in a saucepan and cover with water. Bring to the boil, reduce to a simmer and cook until just tender, about 30 minutes. It’s good if the barley still has a little bite; it tastes nutty that way. It shouldn’t cook so much that it goes ‘creamy’ and starchy. Drain and add the plain olive oil, salt and pepper. This keeps the barley moist. I don’t dress it further until it’s cool, otherwise it just soaks up masses of vinaigrette. Once it has cooled, mix with the other ingredients, taste for seasoning and serve. Cook the barley as above. Fry 225g (8oz) mushrooms, sliced, in 15g (½oz) unsalted butter until well coloured and quite dry. Season and toss with the barley along with 75g (2½oz) baby spinach, shredded or torn, plus balsamic vinegar and extra virgin olive oil as above. Serves 6. The other barley salads here are fine at room temperature but I prefer squash hot, so cook 750g (1lb 10oz) squash (deseeded, peeled and cut into chunks) with 2 tbsp olive oil and seasoning for about 30 minutes in an oven preheated to 200°C/400°F/gas mark 6. The squash should be completely tender and slightly caramelized. Meanwhile, cook the barley as in the main recipe but dress it immediately with the 1 tbsp extra virgin olive oil and 1½ tsp balsamic vinegar. Season and add 2 tbsp chopped fresh coriander and 2 red chillies, deseeded and finely sliced, and the squash. Serve immediately. Chunks of crumbled feta cheese don’t go amiss here, either. 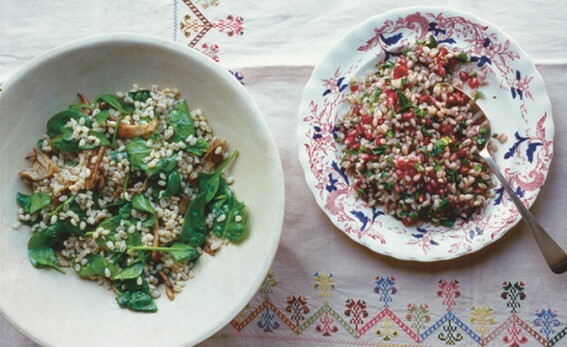 Lots more barley salads… Cook and dress barley (you can eat it hot or cold) and toss with cooked French beans and bacon; soaked dried fruits and hazelnuts; pitted cherries and mint or tarragon; preserved lemon, chorizo and mint; smoked fish, watercress and dill.